This Christian, charitable organization exists to help develop committed families, healthy communities, and valiant nations by teaching proven biblical principles your marriage and family can count on. Descendants International was born out of a passion for helping a bride and groom prepare for their wedding ceremony, a lifetime together, and help parents establish a cohesive and healthy family as they realize the certainty of God’s love for each family member. Blended families, when one or both of you bring children to the marriage, are held especially close to the Wieczorek’s hearts and are a significant focus of Descendants International. Tace and Carmen recognize first-hand what it is to overcome difficult hurdles in blended family living and desire to help others experience the rich rewards found in God’s plan for marriage and family relationships. As co-founders of Descendants International, Tace and Carmen are eager to share this new ministry with you and your community. In 1993, as a single parent, it was important for Tace to find a wife who also had a genuine desire to mother his then, two and four year old children. As Carmen accepted Tace’s marriage proposal, they understood that her personal experience of being raised in a blended family would also be applied to their newly formed family. 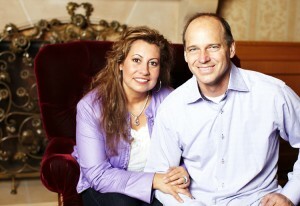 Tace and Carmen continue to seek truth and apply their faith to strengthen their marriage and guide their lives. Creating a marriage focused on fulfilling God’s plan and bringing their lives and families together as one, was essential to the foundation of their own blended family. Since their marriage in 1994, Tace and Carmen have been actively involved in their local church, concentrating on marriage, parenting, and family ministries. Having helped many couples over the years, it has now become more important to work alongside churches and organizations to serve the community addressing marriage and family needs (spirit, soul, and body) consistent with the Word of God. Through Descendants International, they are now able to share the tools to help equip a greater audience. Committed to taking a different path than the status quo models in the media and society of today, they have found that there is a way to have a fulfilling and godly home life. Tace and Carmen welcome the opportunity to meet you and share how their experiences and interests have equipped them to authentically relate to you.